After observing the sisters care for the dying with smiles, tenderness, and compassion, I began to understand why the patients seemed so at peace despite their suffering: They were immersed in genuinely selfless love. Later I would learn that Mother Teresa and the sisters taught the patients about redemptive suffering, encouraging them not to “waste” their pain and explaining that God could sanctify it if they offered it to him through prayer. We felt honored when the sisters invited us to return the next day for Mass in their chapel. When they told us Mother Teresa would be at one of the Masses, we were awestruck. Donna-Marie and her husband decided to go to the early Mass the next morning where Mother Teresa quietly slipped into the chapel. After Mass, the nun walked over to visit with the children and give them Miraculous Medals. According to Donna-Marie, it was exhilarating to stand beside this diminutive giant who spoke with everyone from world dignitaries to dying lepers with the same easy manner. At the same time, it was calming to be in the presence of one who loved so easily and completely. Back home in Connecticut, Donna-Marie felt inspired to write a heart-felt thank you note to this dear nun. To her amazement, Mother Teresa wrote back. Soon, the suburban housewife and the Nobel Peace Prize winner were pen pals, sharing their worlds and prayers for one another. Over the next ten years, there were twenty-one letters of encouragement, advice and shared prayers as well as a long-distance phone call and face to face visits at Missions of Charity convents. God will bless you for all the good you have done in starting the lay Missionaries of Charity in New Milford. Be assured of my prayers. Christ calls us to be one with Him in love through unconditional surrender to His plan for us. Let us allow Jesus to use us without consulting us by taking what He gives and giving what He takes. Although on the surface, it would seem that these two women lived in very different worlds, their spiritual connection put them on the same path in much the same way. Mother Teresa was never a biological mother, yet she mothered everyone she met. She understood what it was like to be a mother and she also understood that the secret to sanctity and true happiness lies in seeing the little tasks that we often think are mundane. Such acts of loving service, she taught, are huge in God’s eyes. Through Mother Teresa’s influence, Donna-Marie came to understand that her call to holiness was the awareness that God was sanctifying her vocation as a mother when she gave it all to Him. When Donna-Marie first met Mother Teresa, she had three young children. There would eventually be two others born in spite of serious complications as well as a number of miscarriages, one of which was life threatening. Her friend not only prayed for her but also showed her suffering in a different light. Mother Teresa ‘prayed me through’ another high-risk pregnancy, as well as some other spiritually exhausting circumstances. Again and again, she taught me about the hidden, mysterious graces that can be found in suffering. More than once she told me: ‘You have come so close to Jesus on the cross that He can kiss you.’ More than once these words affected me intensely. Donna-Marie saw that Mother Teresa surrendered everything to God. She taught that to do everything “with Jesus, for Jesus, and toward Jesus” makes our lives a prayer. 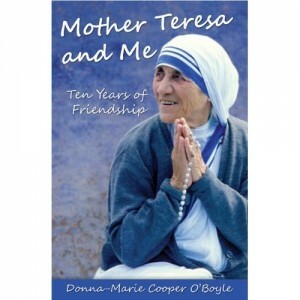 During the time of correspondence with Mother Teresa, Donna-Marie kept their friendship close to her heart. After all, how does one treat such a relationship with one of the most famous and holiest persons in the world? To share it with others could be mistaken for bragging or tempt one to pride. But as Mother Teresa built her up and encouraged her writing and spiritual growth, Donna-Marie’s life eventually unfolded in a very public way. This humble mother and housewife did begin to write books and articles and also to speak before audiences. Today, she is a frequent guest on EWTN television and a regular on Ave Maria radio segments called “Mom’s Corner” with host Teresa Tomeo. Through her love of God and her family, she has become the face of motherhood. In addition, she has been a catechist for over 20 years at her parish and a Eucharistic minister to the sick. She founded the “Friends of Veronica” as on outreach to seniors, the sick and the lonely in nursing homes and hospitals. In 2008, Donna-Marie was invited by Cardinal Rylko, President of the Pontifical Council for the Laity to participate in an International Congress for women at the Vatican. Those are just the highlights. One cannot but help to see the mark of Mother Teresa on Donna Marie’s life. It is a mark that Donna-Marie hopes will be imprinted on the lives of others, not through changing their circumstances, but by seeing life through the eyes of Mother Teresa. If there’s just one thing I hope to get across in this book, it’s that we don’t need to rush off to Calcutta to find the poor….Just because a person appears to be doing well outwardly does not necessarily mean that he or she is doing well interiorly. That’s where we come in. Like Mother Teresa, we too need to arm ourselves with deep prayer, humility, and a giving love…. We are all called to love our neighbor, even those who irritate and annoy us, those who steal our parking spaces, those who make fun of our devotion, those who ridicule us, those who belittle us, attack us, and antagonize us – these are the very people we must love and pray for. Maybe they are cranky and unhappy because they are starved for love. A smile, a gesture, or a kind word can work miracles. God puts difficult individuals in our lives for a reason. We may never see the happy outcome, but we must trust, love, and pray and let God do the work. To see Donna-Marie’s interview with Doug Keck on EWTN’s Bookmark program go to: www.donnacooperoboyle.com.